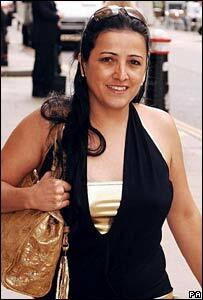 Brazilian Roselane Driza faces prison then deportation from the UK after being convicted of blackmailing a female judge and stealing intimate videos from a male judge. She had worked illegally as a cleaner for both of them. She was sacked by the female judge and had an affair with the male judge. All three ended up facing each other at the Old Bailey. Sixty-year-old Judge Mohammed Ilyas Khan and his female colleague - known in court only as Judge J - were both immigration judges who remained friends after their relationship as lovers came to an end. The Old Bailey heard how Judge J sacked Driza for being unreliable and for criticising a friend. The Brazilian then started an affair with Judge Khan and moved in with him. The 37-year-old told the court she found two intimate videos of Judge Khan - in one he was with Judge J and she was apparently snorting cocaine. She claimed that in the other he was with a blonde woman. Judge J said she had never knowingly been filmed and that she had never taken cocaine. Driza said she kept the videos because she feared Judge J might get her assassinated. Then followed the blackmail allegation. Driza was accused of threatening to report the judges to their boss the Lord Chancellor unless Judge J paid her £20,000 - supposedly as compensation for losing her job. The court was told details of text messages and emails sent by Mr Khan to Driza in which he called her "real chilli hot stuff". The judge had "made a fool of himself" in the relationship and admitted becoming "a complete and total puppy to her", the jury heard. Driza initially came to London, where her cousin and brother were living, to learn English so she could teach. During the trial she stated she wanted to be referred to as an undergraduate not a cleaner. She produced a letter apparently from London Metropolitan University which said she was on a humanities course studying education and philosophy. In the courtroom she began giving evidence in broken English, but later turned to speaking Portuguese through an interpreter. Throughout the trial both judges' identities were kept secret - a standard legal move to encourage blackmail victims to come forward - and they used a different entrance to avoid press photographers. The trial judge accepted a request from the media to lift a court order banning the publication of Mr Khan's name because the evidence which came out touched on his public role as a judge. Judge J was allowed to remain anonymous because she was the victim of blackmail. Driza had been in the UK seven years before the offences took place, according to Home Office records. She was allowed to be a student for a year from August 1998, but was not given permission to work at any other time. She arrived at Heathrow airport on 6 February 1998 on a Brazilian passport and was allowed to remain as a visitor for six months. Driza applied to stay as a student on 11 August of that year and was granted leave until August 1999. She applied for indefinite leave to remain in June 2002, but it was rejected in November 2003. She appealed against the decision the following month, but it was dismissed two years later. Driza then took her case to the Immigration Tribunal but in April this year was refused leave to appeal. Driza's Albanian former husband is serving 20 years in Italy for the murder of a fellow Albanian in Sicily. He is wanted in the UK for the murder of Kosovan Bledar Mone, 24, in Sudbury, Middlesex, in 1999. Driza met him in a nightclub and after seven months they married at Barnet Register Office but separated two months later when she found he had lied to her about his background. She was unaware that the man she knew only by his assumed name of Sokol Drenova was a member of the Albanian mafia. After the verdicts Detective Sergeant Alan Dawson from the Metropolitan Police said it had been a difficult case. "This six-day trial has involved a detailed and protracted investigation into the private lives of all the concerned parties," he said. "This case is particularly disturbing as the offence has been perpetrated by a defendant who has been determined to prey upon the victim and threaten her for financial gain. "I hope today's verdict demonstrates the Metropolitan Police's commitment to bring all such offenders to justice." Old Bailey Judge Peter Beaumont is now awaiting reports before sentencing Driza. She has been warned that she faces a substantial custodial sentence and that she is liable for deportation back to Brazil. But it is not the end of the story for the two judges involved. The Department for Constitutional Affairs has said the Lord Chancellor and the Lord Chief Justice will look at the contents of the court proceedings "as a matter of urgency" before making a decision about any disciplinary investigation.